Learn more about the Alemite, 8322-A 1/2" Diaphragm Aluminum diaphragm pump with pricing info, a list of features, and frequently asked questions. The Alemite, 8322-A 1/2" Diaphragm Aluminum Pump is a diaphragm pump with an aluminum frame. The 8322-A's inner diaphragm is made from buna rubber for added durability. Aluminum body material, Buna diaphragm material. With 100 psi Diaphragm Pump Pressure. Pros: Sturdy aluminum construction. Can pump a variety of fluids. Cons: Small 1/2" inlet and outlet. Bottomline: The Alemite 8322-A is a reliable diaphragm pump that can be used to process many different types of low-viscosity fluids. The Alemite 8322-A 1/2" diaphragm pump costs $688.79. What fluids can the Alemite 8322-A pump? The Alemite 8322-A can pump low viscosity fluids like engine oil, washer fluid, and antifreeze. What is the diaphragm in the 8322-A made out of? The diaphragm component of the 8322-A pump is made from buna, a type of rubber that is resistant to oils and lubricants. Are there any Alemite, 8322-A 1/2" Diaphragm Aluminum Pump alternatives? Welch, 2014B-01 1 Ph DryFast Collegiate Diaphragm Pump. 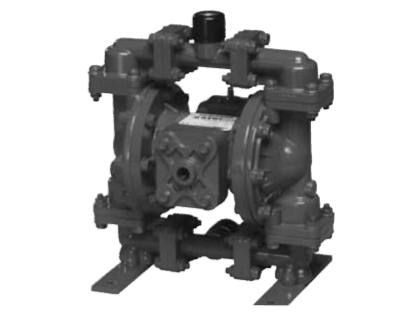 Welch, 2037B-01 1 Ph DryFast Diaphragm Pump. Alemite, 8301 1/4" Diaphragm Poly Pump, Teflon Diaphragm Material. Welch, 2019B-01 Diaphragm Pump - Vacuum Filtration. Ace Glass, 13070-07 Liquid Pump, PTFE Diaphragm, Analog.